I previously said that I’m very lazy when it comes to paying my bills, specifically my Smart Bro bills. I find it a big hassle going to Smart Center or to any bayad centers. This laziness of mine prompted me to look for an easy way pay my bills. That easy way is by paying my Smart Bro bills through BPIExpressOnline. Paying bills through BPIExpressOnline requires enrolment. So I enrolled my Smart Bro bills first before paying my last month’s due with Smart. For easy steps in enrolling your bills please read my post How to Enroll Bills in BPIExpressOnline. Step 1: Log-in to your BPIExpressOnline online. Step 2: Initiate bills payment by hovering the mouse cursor over the “Payments & Reloading” link then click “Bills Payment” and click “Pay Bills Today”. See the image below for details. 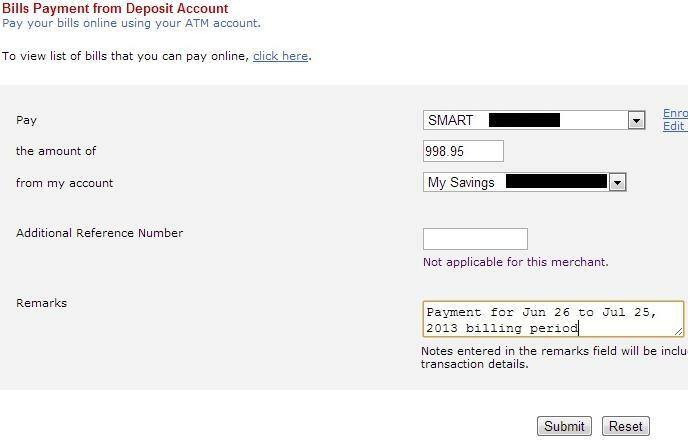 Step 3: Put in your BPI account details, merchant details, and amount to be paid. This page also allows you to input remarks. I suggest that you type in remarks on this page so you can have a reminder when receive the confirmation email for this payment. Click the “Submit” button after you checked that the details you entered is correct. Step 4: Check the details of your transaction on the pop-up window that appeared. Click the “OK” button if everything is correct. A confirmation page will appear, which confirms that you’re done paying your bill in BPIExpressOnline. Just follow the steps written here for every bill that you need to pay. For steps in enrolling your BPI account in BPIExpressOnline, please read my post How to Enroll at BPIExpressOnline. Images for this post were screen-grabbed from BPIExpressOnline.